preventation in Native american youth. Photo by Nicolas Cordero. Last month, Rocky Mountain College celebrated the 4th Annual Art & Science Research Symposium on campus. The symposium was composed of multiple presentations of undergraduate and faculty conducted research ranging from topics such as viral causes of fish tumors in Montana waterways to studies on substance abuse prevention with Native American youth. The event was broken up into two sessions. The first session was held in Fraley Lounge and dedicated to the poster presentations. RMC student Tommy Little presented research on the surface-based body shape index, an alternative to the standardized body mass index (BMI). Sophomore Jacob Myers displayed research on the examination of animal species distribution in the Absaraoka-Beartooth wilderness conducted by RMC’s environmental science department. The biology department’s study into the phosphodiesterase (PDE) enzyme and how it relates to fish retroviruses was presented by sophomore Faith Robichaud. Other research studies focused on rock fall hazards in the Eagle Formation, brain wave fluctuation and class attentiveness, and an analysis of green alga (Chlamydomas Reinhardtii) to find a variant that can produce bigger amounts of hydrogen. These were presented by Alethea Shaules, sophomores Kayla Moreno, and Shannon Fisher with Marco Quinones. Following the poster presentations, the crowd gathered into Taylor Auditorium in Losekamp Hall for oral presentations. 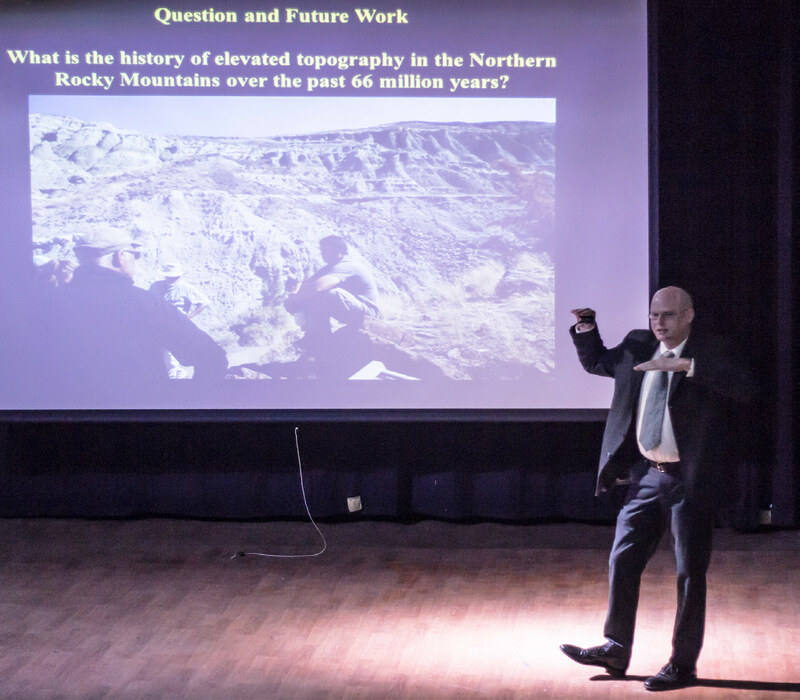 Dr. Derek Sjostrom of RMC’s geology department spoke about surface elevation and topographic development’s effect on climate. 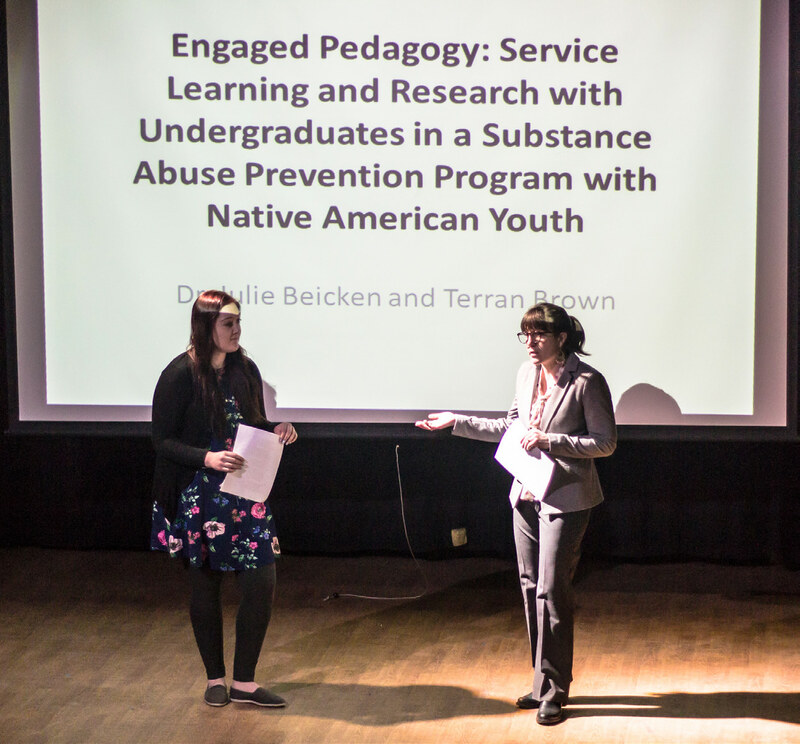 He was followed by Dr. Julie Beicken and sophomore Terran Brown who conveyed their studies on substance abuse prevention in Native American youth. questions for possible future research. Photo by Nicolas Cordero. Student speakers included Mira Cleveland, Gabriel Aponte, Noah Oloff, Hunter Anderson, Josh Lieuallan, Cameron Woods, Krystal Lira, and Sierra Hentges. Other notable speakers included doctors Jennifer Parks, Megan Poulette, Holly Basta, Emily Ward, and Luke Ward.